Personal appreciation for specific plants ebbs and flows as time progresses. This may be a product of following trends, discovering a genus for the first time, meeting an exceptionally well-grown plant, or in my case, a result of family discrimination. The plant that I speak of, so unfairly snubbed, is the Eastern red-cedar, Juniperus virginiana. To understand why this evergreen has earned such disdain, one must first look at look at its ecology. Juniperus virginiana is exceptionally prolific in the limestone-rich soils of the Shenandoah Valley. Such proliferation and success is observed throughout the Virginias and into Kentucky and Tennessee. The dense conifer is categorized as a pioneer invader meaning that it is one of the first plants to repopulate cleared or eroded land. Pastures, fallow fields, and roadsides are quickly colonized by young trees. The shady forests of the Northeast kept the tree in check, while the periodic prairie fires of the central grasslands suppressed the fire-intolerant juniper in the central United States. 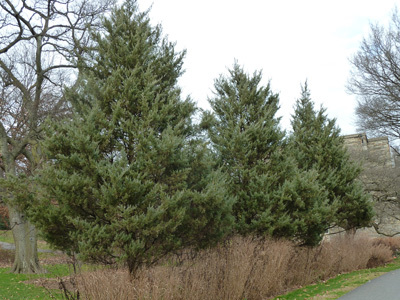 Eastern red-cedars are detrimental to prairies due to their ability to shade out grass species and their needles raise soil pH, making it alkaline, which makes it harder for other plants to absorb nutrients. Forest and prairie fragmentation have enabled the juniper to develop a strong foothold to the point where this native tree is invasive. My father, a farmer, vocally and repeatedly shares his dislike of the Eastern red-cedar. Routine maintenance is required to keep seedlings from taking over pastures and clogging fencerows. The apple industry advocates against Juniperus virginiana for the role it plays in supporting the fungal lifecycle of cedar apple rust. The fungus overwinters in spherical galls on the conifer. Spring rains help transmit the fungal pathogen to apple trees which lead to defoliation and blemished unmarketable fruit. The disease can also infect ornamental Malus (Asiatic forms show resistance). Fungicides, planting resistant apple cultivars, and/or removing nearby red-cedars control the disease. While it is hard to look past the previously mentioned character flaws, further investigation reveals a more complex character. Native American tribes used the fine-grained wood to craft bows and mark out agreed tribal hunting territories. French traders named Baton Rouge, Louisiana, which translates to “red stick” for the natural pink to brownish-red color of these poles. The heartwood is rot-resistant, ironically making it an ideal fencepost. Furthermore, the aromatic wood deters moths and is used to make cedar chests and as a lining in closets. Pencils made pre-1940 were almost entirely manufactured from J. virginiana. The fleshy ovoid cones are used to flavor gin. Mammals and birds, particularly cedar waxwings, are fond of the fleshy cones. Able to withstand adverse growing conditions, planting the tree was advocated during the Dust Bowl drought of the 1930s to create windbreaks. In the south, west to the Ozarks, the eastern red-cedar is used as a Christmas tree. To this day my family celebrates the holiday with a “cedar tree”. Several prominent horticulturists have shared the belief that the best days are still ahead for the conifer. The plant can fill many roles: as a specimen or grouped to create a screen, planted for windbreaks, hedges, or clipped for topiary. Recent selections have focused on color and shape. Several cultivars showcased at the Scott Arboretum include J. virginiana ‘Burkii’, Emerald Sentinel®, ‘Taylor’, and ‘Grey Owl’. A pedestrian pathway divides the Biostream into two distinct sections. Flanking either side of the path are several ‘Burkii’. The cultivar creates a distinct pyramidal shape that often reaches heights of 25’. 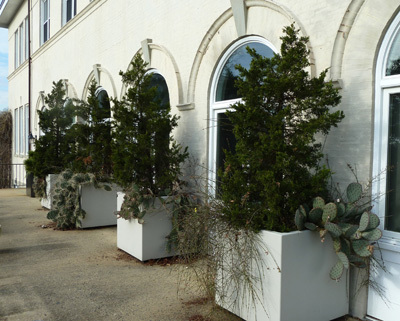 Emerald Sentinel® can be seen growing both in ground and in four large permanent outdoor containers in front of Pearson Hall. The hardy nature of the plant and strong green color, coupled with its smaller stature, typically reaching 10-15’ in height, make it a good choice for those with limited space. Consider ‘Taylor’ for an even narrower and more upright choice. Two plants along the north entrance to Parrish Hall create a strong linear form to complement the vertical elements of the building. Cut greens from ‘Grey Owl’ are always popular at the annual Holiday Greens Sale. Soft silvery gray foliage complements most any color scheme and provides a year-round presence in the garden. The cultivar is lower growing and wider spreading than the other featured selections. A mature planting can be seen in the Nason Garden. While the species is not without flaws, its many attributes: array of forms and colors, durable nature, and variety of uses make it worthy of consideration. 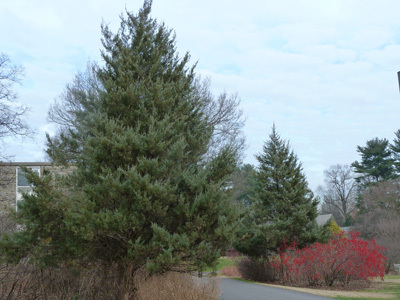 The Scott Arboretum grows roughly ten cultivars of Juniperus virginiana, all of which can be seen year round, free of charge when you visit the gardens. I’m using the red-cedar in a mixed border to block the wind and a view to neighbors. Love how quickly it is growing and its fine texture. Thanks for the insightful and beautifully written post! Good job on improving the image of the red cedar. Here in the midwest, we too have them appear on occ. To see the incredibly knarled and centuries old cedars hugging limestone bluffs is a thing of beauty indeed! I’m in GA zone 7 and the only Juniperus virginiana I see planted state wide is the Burkii or Brodies the males. I don’t ever see any females with the winter berries. I have decided to plant a female cultivar in my yard as a wildlife specimen. I just hope there is a male nearby to pollinate it afterall I want the berries so the birds & other game can eat from the tree. Sometimes I see females on the roadsides with berries or on land not yet developed but then the developers come & wack all the red cedars down to pave & build a new business. In turn the landscapers in GA plant mainly plants like leyland cypress, crape myrtle, cryptomeria & many other foreign species. I want to spread the word in my community to use the red cedar more often and to help wildlife out by planting this tree and other North American native shrubs & trees. The great variability of form within Juniperus virginiana can be a detractor from a design point of view. Many of the cultivar selections are clones which pass on and retain a desired shape. Many of these clones, J. virginiana ‘Canaertii’ and ‘High Shoals’ for example, are females, while ‘Burkii’ is a non-fruiting male clone. Eastern red cedar should do very well for you in Georgia. It’s hard to top a native plant that is adapted to the south’s heat, humidity, and clay soils. If fruit set is desired, consider planting a mix of seedling grown plants. If a particular shape or cultivar is desired, plant a known male and female cultivar. Juniperus Virginiana var. Silicicola ‘Brodie’ is a female, not a male. 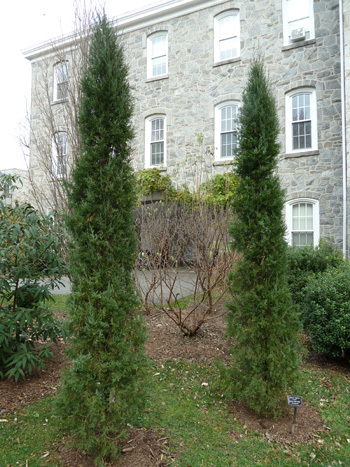 Please help…What spacing should be used for a Juniperus virginiana ‘Taylor’ hedge? My clients need a tall, narrow evergreen hedge for privacy. Tank you! 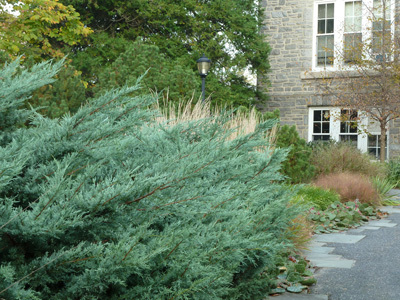 ‘Taylor is a very narrow cultivar of Juniperus virginana. While it grows tall, it only spreads 3-5 feet, thus requiring many plants to make a tight/full screen.